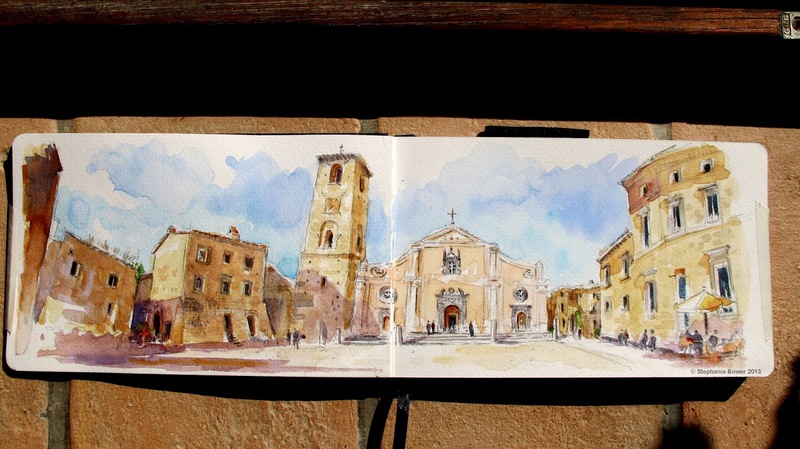 Piazza San Donato in Civita di Bagnoregio, an amazing Italian hilltown. One day in Rome, One Sketch in Rome in blazing heat and millions of tourists! 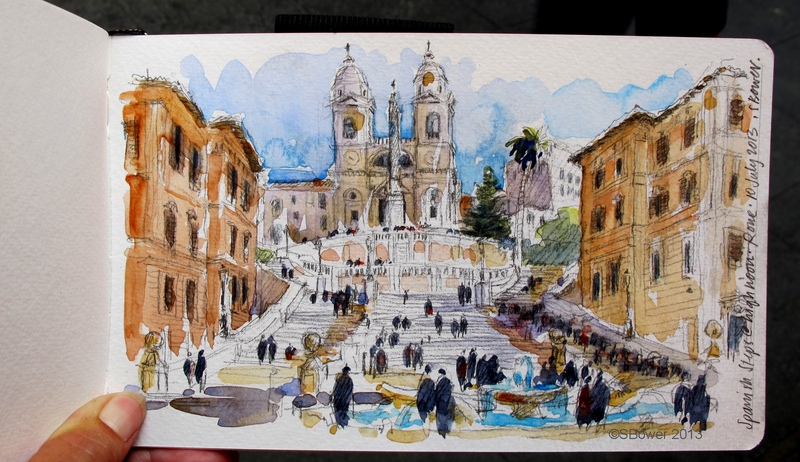 Then came the Urban Sketcher's Symposium in Barcelona! It was a wonderful, wonderful experience--an incredible city, amazing instructors and unbelievably well-organized. Kudos to all the sketchers who put in countless hours of volunteer time to pull it off. I also got to see Gail Wong and her husband John there--she did beautiful sketches! Also briefly saw Jackie, didn't see Tina somehow...there were lots of people there. I saw Gail and John on Sunday at the Sagrada Familia where Gail and I were sketching. See below. 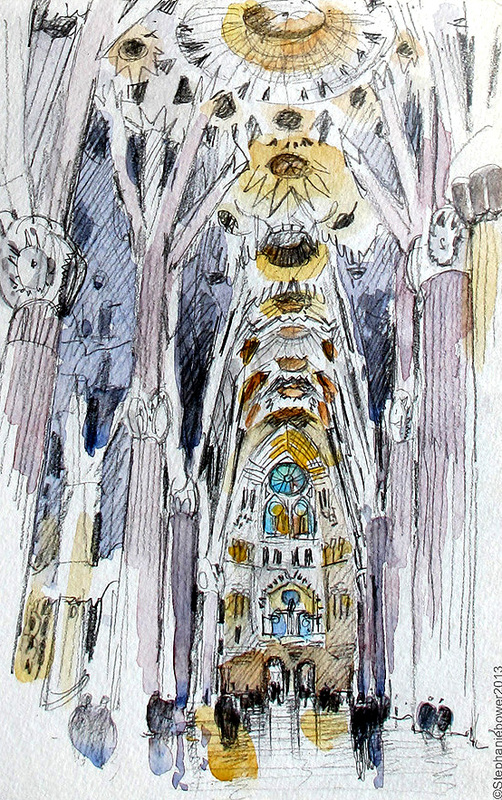 Full sketch, Sagrada Familia interior. I hear the weather has been great in Seattle--I hope you all are enjoying the summer and doing lots of sketching. For more of my sketches and paintings, as well as drawings from my Gabriel Prize project, please check out www.stephaniebower.blogspot.com. Stephanie, so glad to meet you in Barcelona! I love your sketch of La Sagrada Familia especially--so difficult to show the immense scale and splendor of that place--you did it. Hi Virginia, Wow--thank you so much for looking at my sketches and for this very nice message! Yes, Sagrada Familia may be the most difficult subject I've ever attempted to sketch. It's crazy! I am so glad to have met you in Barcelona, glad to have gotten to take your workshop--it was great and you are a really good, natural teacher--muchas gracias!